A look at Google searches for several marketing-related PR terms shows social media marketing leading the way. Another trend is the disappointing showing for employee communications. Media relations, as could be expected, is very low in terms in the number of searches being conducted on Google. U.S. vs global searches yield some interesting differences. The mood of the moment when people are making predictions often influences what they see for the year ahead. As we reached out to communicators for our annual predictions feature, headlines were blaring about the NY Times' scathing Facebook article in late November. As a result, though a multiplicity of issues was discussed, trust often seemed top of mind. PR News' regular Roundtable feature asked senior communicators to discuss what they believe will be the toughest challenge in 2019. Perhaps concerned with the headlines of the day, many of them had trust and integrity issues on their minds. Others mentioned breaking through the clutter to get their narrative heard. Too many PR pros look askance at measurement. That's not the issue with measurement advocate Graeme Harris, but he wants to know the most cost-effective way of measuring. Is it preferable to have your in-house staff do the collection and analysis, or contract with an outside firm to handle things? Harris does the math on both options. One of the top issues with PR pros asked to pitch stories to the media is getting coverage in major media. So many executives think the Sun rises and falls with the Wall St. Journal and the NY Times. OK, so how do you get a mention in one of those papers? We asked someone who's climbed that mountain to give us tips. A sobering thought as we enter 2019--most Fortune 1000 executives don't have confidence in their company's ability to respond well to disruption or change. APCO Worldwide's research of 527 of these executives lead it to join forces with three other PR consultancies to help companies become more agile. They believe agile and curious firms are better able to respond to change. 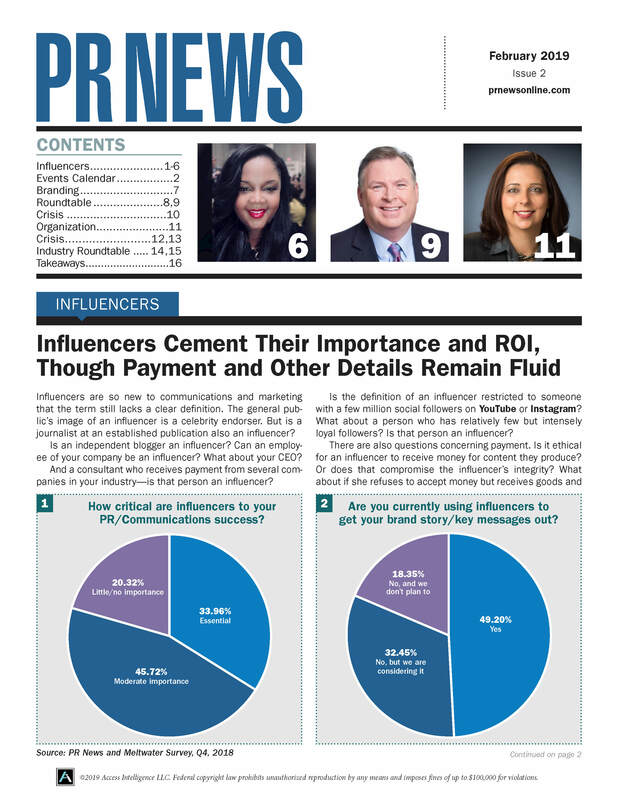 In each edition of PR News we highlight takeaways from select articles as well as important additions to the PR News Resources Center, which is available only to paid subscribers. This edition also includes a note about our upcoming subscriber call (Dec. 12 with crisis guru Kevin Elliott of Hill + Knowlton Strategies) and the PR News Crisis Summit in Miami Beach.